We received some more printers (as good as new) by Ricoh, including a colour multifunction printer. Today a truck company delivered them to our storage at no charge. Thank you very much also to Mr. Machowetz for the great organization and support! 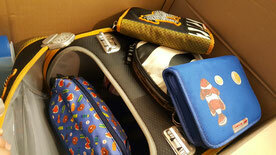 Susanne Unterkofler sent us a parcel containing a beautiful schoolbag and several pencil cases with pens, pencils, crayons etc. Please keep collecting, the donations are going to make many children happy! Austrian donors: Please feel free to send your collected items directly to us (not via Germany). Do not hesitate to contact us. 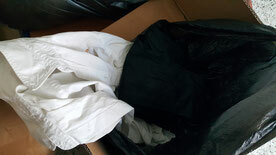 Sandra Ramharter brought several big boxes with clothing and shoes. She's very dedicated and supports us in many areas.